Chopping Mall Bloody Orange Julius - A Throwback to the 80's! Learn how to recreate the nostalgic flavor of an ice-cold Orange Julius from the mall, but with a delicious blood-red twist! 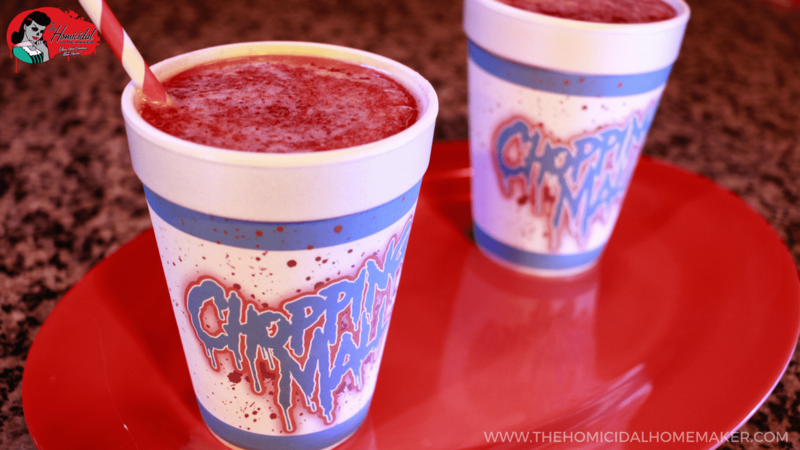 This recipe for my "Chopping Mall" Bloody Orange Julius is also gluten-free and vegan-friendly. This Chopping Mall Bloody Orange Julius will send you straight back to the 80’s! Some of my favorite 80’s flicks have scenes featuring malls – Commando, Night of the Comet, and of course…Chopping Mall. When I was a kid, going to the mall was nothing short of magical – arcades, toy stores, and most importantly, the food court! Any trip to the mall always ended with an ice cold Orange Julius. So in celebration of one of my favorite films combined with those nostalgic memories, I wanted to create that same flavor at home, but with a fun blood-red twist. This delicious blood-red twist on an icy-cold Orange Julius would be the perfect addition for any Halloween or horror-inspired gathering. Best of all – my recipe for my Chopping Mall Bloody Orange Julius is also vegan friendly, and can be made with reduced sugar. If you are unable to find blood oranges in your area, don’t worry – this recipe for my Chopping Mall Bloody Orange Julius is just as delicious with regular, fresh-squeezed orange juice! If you’d still like to get that blood-red color, try adding in a little grenadine, pomegranate juice, or red food coloring. As always, be sure to watch all the way to the end for fun cinematic vignettes before and after the Chopping Mall Bloody Orange Julius recipe segment! And if you enjoyed this episode, please be sure to hit that ‘subscribe’ button, and give it a ‘thumbs up’ over on my YouTube channel! Also, feel free to head over to the Recipes and Horror Cooking Show pages of my website for more awesome horror themed recipes! Measure out 8 fl oz of freshly-squeezed blood orange juice, 1 T of vanilla-flavored coffee syrup, 1 T dry vanilla instant pudding mix, and 1-2 C of crushed ice. Place all ingredients in blender, and blend until frothy. You may need to add more or less ice, depending on how icy you like it (1-2 C seemed to be the best amount). Serve immediately. If you can't find blood oranges in your area – don't worry! This recipe is just as delicious with regular freshly-squeezed orange juice. If you'd still like that blood-red color, add a little red food coloring, pomegranate juice, or grenadine. Did you make this recipe for my Chopping Mall Bloody Orange Julius? Be sure to post your photo on Twitter or Instagram with the hashtag #HomicidalHomemaker for a chance to be featured!